A wedding on a budget doesn’t mean you have to sacrifice quality. In this post, we will show how to save money on an elegant wedding with some wedding cost saving hacks. There’s no reason to start your new marriage in debt! Learn below to make a wedding look expensive at a fraction of the cost! Several years ago when I first started blogging, someone was appalled that I would ever encourage DIY weddings. In fact, she sent me quite a few emails about how I was ruining people’s weddings by suggesting this, and that no one should have a budget on their wedding. When we got married over five years ago, we planned it in less than two months, we did a lot of things ourselves, and it was beautiful. It was definitely the wedding of my dream. The average wedding costs over $30,000 according to The Knot. I cannot even fathom spending that much on a wedding – I think mine was about $5,000 (which still seems like a lot.) So, if you are a bride on a budget, here are 15 smart ways to save on the big day! If you are going to have a wedding on a budget, you have to first offset that budget! I’m sure every bride-to-be has some aspect of her wedding she has her heart set on. Maybe you want a designer gown or a fancy sit down dinner. Or maybe you want people to wave sparklers as you drive away. Whatever it is, if there’s something you really want, figure out how much that costs in the beginning. It would be really unfortunate to realize you’ve already spent too much money before you’ve already booked or bought that one aspect of your wedding you really were wanting. With Pinterest at everyone’s fingertips, it’s easier than ever to do a lot of your wedding decorations, planning, and food yourself. Now, if you don’t have a creative bone in your body, I wouldn’t necessarily go this route by yourself — consider enlisting willing friends and family. Sometimes it is worth it to hire someone else out to do all the grunt work, but sometimes, you can make some great memories doing things yourself! —Dollar Store Wedding Ideas: What to Buy to Stay Under Budget! If you own a Cricut machine, there are SO many amazing things that you can do! You can make decorations, invitations, and so much more. Definitely check out their wedding “Make it now” projects for some ideas. Shindigz – I LOVE this website! They offer amazing wedding decor, party favors, etc. for great prices – especially if you want personalized things. They have some great sales, especially if you sign up for their newsletter. They even offer free event planning services. Craftsy – this is a great website to check out if you (or someone in your wedding party) are wanting to learn how to decorate cakes or photography. CreativeLive has some AMAZING floral design classes. If you catch them live, they are free, but you can pay for past classes (which I think is totally worth the money. Flowers are expensive!). Animoto – who doesn’t love a good wedding photo slideshow – you know, the ones with photos of the couple growing up and dating? LOVE them. Don’t hire someone to make one – you can easily do it yourself. I used Windows Movie Maker when I got married, but I really love Animoto. They make it so easy. It’s very inexpensive for professional quality videos. Make your own playlist – can’t hire a DJ? No problem. Here is a playlist you can use! I love Etsy for many things, and I think weddings are definitely at the top of the list. You can find just about everything you need for your wedding here, and it’s often very affordable. They literally have everything from wedding invitations to bridal gowns! I love Groupon – while there are occasionally a few duds, I’ve overall been very pleased with the Groupons we have purchased from there. They have SO many options for weddings – from wedding rings, to videography and photography, to caterers…you would be remiss NOT to see what they have. Always make sure you read the reviews to make sure you aren’t getting someone unreliable, but overall, there are a lot of possibilities to save. However, we live in a time where there are MANY ways to save on honeymoons. For instance, Groupon has many affordable getaways. Airfare Watchdog can help you make sure you get the best deals on airfare (among other things). I also really like TripAdvisor for planning vacations. Airbnb is a great option for finding a nice place to stay once you get to your destination (and you can $40 in credit when you use this link). Airbnb can also be a great option for out of town guests coming to your wedding- here is a beginner’s guide to Airbnb in case you aren’t familiar with it. Here are a few more tips on how to save money while traveling. Wedding invitations can be expensive, but fortunately, in this day and age, there are many things you can do to make them more affordable. For instance, you can design one yourself using a program like PicMonkey and then print them off at a place like Costco. Or you can print them at home if you have a good enough printer (if you have an HP printer, you’ll probably want to consider using HP Instant Ink to help save on ink – you can get your first month free here). You can also make your own if you are feeling creative (using a Cricut machine makes it easy!). You could consider using Evite if you want to go all digital. They have some pretty awesome options – even if you just wanted to use this for save the dates, bridal showers, etc., it can save you a lot in the long run! If you aren’t feeling particularly creative, you can always turn to Etsy. So many beautiful designs available – either that you can have them customize and then you print them off, OR you can have them create them and send them to you. Typically, this will be less expensive than turning to a big company. And, if all else fails, here are a couple of online retailers that are very affordable and often have great discounts. Several of these also offer other wedding offerings (such as guest books – though I prefer Blurb for those), so keep those in mind as well. I’m not the best to speak on this, because we invited pretty much everyone to our wedding reception in Colorado. Which I loved. However, it can be pricey to invite tons of people, especially if you are wanting to have a nice, sit down dinner. You can cut a lot of costs by limiting who you invite because you’ll have to buy less food, perhaps have a smaller venue, and spend less on invitations. Be aware, you might hurt feelings — it’s probably inevitable. When I got married, we had a lot of help from family and friends, and members of our church congregation. People were always asking to help. But even if no one offers to help, don’t assume they don’t want to. If you are doing any of the wedding decorating or cooking yourself, put yourself out there and see if people would be willing to help. Just putting a simple and short plea on Facebook is usually enough to call people to action. One of the most expensive parts of a wedding is the food. There are many different ways of serving food — sit down dinners, family style, or a buffet style. It can get pricey, fast, depending on how many people you are serving. While making the food yourself can be stressful, it can pay off in the end. I’ll write a post later about simple meal ideas for a wedding, but even just buying food from separate vendors can lessen the cost. For instance, we had soups at our wedding, and we made one of them, bought one at Red Lobster, another at Olive Garden, etc., and it ended up being cheaper than if we had hired a caterer. And, don’t feel like you have to have a full-course meal, either. I’ve been to receptions that have just served desserts, and it’s been great. Be sure to check out my post about our winter wedding reception where I talk about our soup bar and hot chocolate bar more in depth. Cakes can be tricky to make yourself, but it’s possible. I do recommend trying your hand at the cake and cupcakes if you want to try this out. Craftsy has some amazing cake decorating classes you can take online for under $20, so definitely check those out. You can buy some great cake decorating supplies on Amazon. If you want to go the cupcake route, this is a great cream filled cupcake tutorial. I actually am also a big fan of Costco sheet cakes and Sam’s Club cupcakes – very inexpensive and SO good. I also highly recommend checking out the Dollar Tree – and yes, I’m being serious. They seriously have SO many wedding supplies – plates, cups, flowers, decorations…SO much. You can even buy online in bulk to make it even easier. You can check out our favorite Dollar Tree wedding ideas here! JoAnn’s, Michaels, and Hobby Lobby always have coupons. Not only can you print coupons from their website, or get them in their monthly mailers, but they have mobile apps that have coupons as well. And, not only can you use as many coupons as you want, but most craft stores will allow you to use coupons from other stores. I’ve been known to use 10 coupons during one transaction; it’s definitely the way to go. Make sure you download Ibotta. It is an AMAZING cash back app, and they have partnered with tons of stores, including Jo-Ann fabric! Plus, it can help you save up some more money for your wedding. This is something I’m hesitant to recommend, because I did it, and while I’m normally okay with it, sometimes I’m a little sad I don’t have my wedding dress! With that said, I did get a beautiful gown, and if you really don’t think you want to keep yours, renting a wedding dress is a great option. I went to Gowns by Pamela in Provo, Utah, and they had a huge variety of all sorts of different dresses. It is generally quite a bit cheaper than buying a dress that you are going to keep. After I got married, I found out that one of the bridal stores in my area had a program where you could sell your dress back after the wedding and get a good chunk of change back. So there’s another option! Even if you don’t want to rent your gown, I recommend checking out ModCloth. They have BEAUTIFUL gowns for very affordable prices. Here are some other tips for buying a wedding dress. Wedding clothing for your party can get pricey. Typically, people will buy their own outfits, but I think that it’s considerate to make the attire affordable for them as well. Target – I have been in a few weddings where the bridesmaid dresses were from Target. ModCloth – so many unique and beautiful styles for weddings that are very beautiful. They also offer a selection of bridal gowns. Kohls – this is a great place for bridesmaid dresses, as well as suits. I know a lot of people who just have their husband-to-be wear a suit in their wedding instead of a tux. You can invest in a nice suit that will serve more function in the future…and Kohls often has KILLER sales on suits! Le Tote – this is kind of a different program, but I could see it being helpful if you have a lot of wedding related events – such as an engagement party, bridal showers, visiting venues, etc. Basically, you pay a monthly fee, and they will send you clothing you can wear. You can send the clothes back whenever you want (for free), and they will send you a new box within a few days. I think it’s kind of cool! I don’t think I could stress this enough — go to bridal fairs! This is like a one-stop shop for brides. You can meet vendors in your area, get great discounts, and, best of all, win free things. We won free bridals and engagements at the bridal fair we went to, and other prizes that were given out were catering, wedding dresses, wedding rings, honeymoons, and more. Forrest also bought a voucher for $50 that let him rent any tuxedo from a local store (and he ended up getting one that would have been 150+ dollars otherwise.) There are bridal fairs that go on year-round, so be sure to see if there’s one coming up near you. There are certain times of the year and certain days of the week that are considered hot wedding days. if you can avoid it…don’t get married then! Vendors know this, and up their prices, and your chances of not being able to use a certain venue or vendor increases. By having your wedding during “off season” you’ll likely find better prices and availability. As a general rule, weekdays, mornings, or Saturdays in November or January are the least popular times of year to be married. You don’t have to get married or have your reception in a huge, expensive reception hall. These places are nice, but often come with certain stipulations, such as having to use their caterer, decorator, etc. Search out different locations; there are all sorts of fun places that you can get married or have a reception that won’t cost you a ton. Everyone knows someone; ask around for recommendations on less expensive photographers, caterers, or florists. Perhaps you have a family member or close friend who specializes in some kind of wedding niche who may give you a good deal. Use your connections! With that said, don’t take advantage of people, and assume that, just because you know them, they will (or should) work for less. On the flip side, don’t just accept someone’s services just because you know them. Finally, remember this: just because something costs a lot does not mean it is better. You can have a beautiful wedding on a budget. Originally written in 2013; updated in 2019. Hello Katie, wonderful blog! I like your way of describing all the important ideas. Your blog is very helpful. Thank you and keep sharing. Nice tips, I want to plan it at my wedding party. Have you checked your spam and promotions emails? Hey Katie! Great article! These are truly helpful frugal tips on the most costly day for newlyweds. I really learned a lot from it. Thanks for this inspiration. Using connections is a MUST! Love this list, I think it’s more helpful than most of the stuff that we typically see for budget weddings. If you’re interested in learning more about doing the music yourself, or attempting to, check out DIY Reception, it’s a huge guide that we wrote to help couples out. We’re Pro DJ’s on the weekends but we think that couples of all budgets deserve to have great music! Thanks so much, Mike! I just checked out your site — what an awesome resource! Thanks so much for commenting. I’ve gotten some flack from people who think I shouldn’t promote DIY weddings, so I am always happy to connect with others who feel the same way I do! You can definitely have a beautiful wedding on a budget. I loved mine and it was $3000-3500. We had a beautiful ceremony, a luncheon, and a fun reception with a chocolate fountain. Plus I had my dream dress. Planning is key. Free Budget Tracker and Guest List Planner - plus more wedding deals, tips, and MUCH more! Sign up to download your FREE Planning printables! 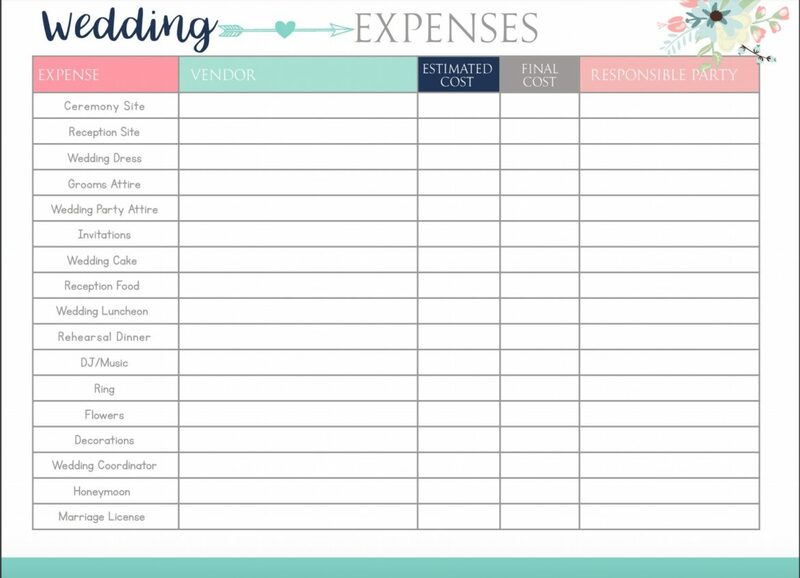 Make planning less stressful with a budget template and guest list planner!